This theme is created based on hugo-coder. I made it possible to tell yourself more by my change. Please see FeaturesOfCoderPortfolio in the post about the change. Have questions or suggestions? Feel free to open an issue on GitHub or ask me on Twitter. A simple and clean blog theme for Hugo. To use hugo-coder-portfolio go through the following steps. Clone this repository into your Hugo project. Add the following lines to your config.toml. baseurl = "http://www.example.com" # Hostname (and path) to the root. title = "Yusuke Ishimi" # Site title. theme = "coder-portfolio" # Set the theme. languagecode = "en" # The site’s language code used to generate RSS. defaultcontentlanguage = "en" # The default content language. paginate = 20 # Default number of pages per page in pagination. pygmentsstyle = "b2" # Color-theme or style for syntax highlighting. pygmentscodefences = true # Enable code fence background highlighting. pygmentscodefencesguesssyntax = true # Enable syntax guessing for code fences without specified language. disqusShortname = "yourdiscussshortname" # Enable or disable Disqus. author = "Yusuke Ishimi" # Author's name. info = "WEB AND APPS ENGINEER" # Author's job title or info. description = "Yusuke Ishimi's personal website" # Site description. keywords = "blog,developer,personal" # Site keywords. avatarurl = "images/avatar.jpg" # Contain the path of the optionnal avatar in the static folder. # Whether you want to hide copyright and credits in the footer. langseparator = "|" # Separates menus from language selectors when site is multilingual. You can look at full working config.toml inside the exampleSite folder. To use multilingual mode, the configuration above needs to be extended by parameters for the specific languages. Each language section overrides default site’s parameters when that language is chosen. langseparator = "|" # separates menus from language selectors. languagename = "English" # The language name to be displayed in the selector. # You can configure the theme parameter for each language. 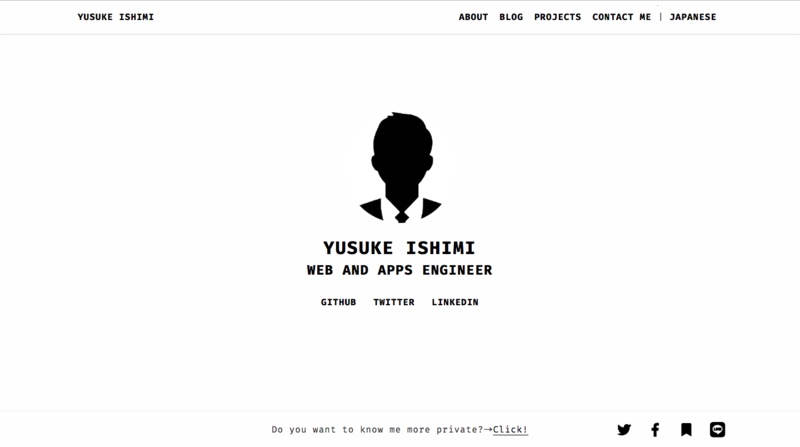 info = "WEB AND APPS ENGINEER"
description = "Yusuke Ishimi's personal website"
[languages.en.menu] # It is possible to change the menu too. keywords = "blog,developer, ブログ, エンジニア"
It is possible to force Hugo to render all default language content under the language code with defaultContentLanguageInSubdir = true. In this case, remember to update your menus URLs (i.e. /en/about/). It is necessary to have less and uglifycss installed to build and run the demo. Assuming that already have NodeJS/NPM installed, run npm install -g less uglifycss. You can disable comments for a post by adding the following to your page meta data: disable_comments: true. All contributors, for every PR and Issue reported.